Tammy’s mouth is crooked. You hardly notice, and she’s beautiful just the way she is. It would be no big deal. Except for how it happened. When the 3-year-old tiger kitty was younger, someone threw a firecracker at her. The cruelty she faced is unthinkable, but luckily the only scars remaining are physical. She was still a sweet, trusting cat, even after life dealt her a few more bad hands. She lost her first home when her owner moved, and then lost her second after she got pregnant on an escape outdoors and had four kittens, and it was too expensive for her family to care for everyone. So she arrived at the Connecticut Humane Society, where she’d get long overdue medical care, and a safe place to raise her babies. And if there was anything this girl needed, it was surely a safe haven. CHS veterinarians found some other damage likely caused by the firecracker: fractured teeth, which were then extracted in a dental work-up, and others that were missing. X-rays showed her jaw bone had been fractured during the incident, and healed in a way that caused her jaw to shift. Luckily, she could still eat like a champ. 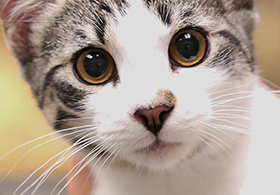 With your support, CHS works to prevent cruelty and stop suffering by partnering with animal control investigators, teaching youngsters about pet care through humane education classes, and educating the public about signs of cruelty and how to report it. But if another Tammy arrives at CHS doors in need of protection and a fresh start, they will get everything they need and then some. Tammy’s now in her new home, happy and cherished as a beloved family member—never again to be treated as an object in a cruel stunt. And her babies have found homes too. Remember, see something, say something. Cruelty is investigated by animal control officers, so be sure to contact your town’s officer if you suspect animal cruelty is occurring.